In our neck of the woods, staying warm in the winter and cool in the summer makes up a considerable portion of our home’s energy use. The good news? These innovative, efficient solutions not only help you stay comfortable – installing them can also allow you to receive rebates. Enjoy versatile energy efficiency through the seasons with Air-Source Heat Pumps (ASHPs). They function as a hyper-efficient central air conditioner, as well as a source of supplemental heat. Combining heating and cooling into one convenient unit, Ground-Source Heat Pumps (GSHPs) operate with 300-400% efficiency, giving them a higher return on investment than any other technology. 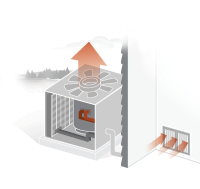 Electric Thermal Storage (ETS) Heating Systems efficiently generate, store and distribute low-cost heat. And they’re versatile—from individual rooms to the entire home, there’s a model that’s right for your needs. ASHPs provide home cooling and supplemental heating with 72% less electricity than conventional air conditioners and furnaces. You can switch between cooling and heating directly from the thermostat, putting you in complete control. These whisper-quiet pumps work their dual magic without an open flame. They don’t create any products of combustion such as carbon monoxide. No need to vent—or worry. Compared to conventional furnaces, the warmth provided by ASHPs distributes more evenly and holds its moisture better, resulting in a more natural, comfortable warmth. The pumps work in tandem with conventional furnaces and automatically select the most ideal balance between the two heating sources, based on your desired indoor temperature. The key to these units’ dramatic efficiency is their ability to transfer more energy than they consume. This is accomplished by using advanced technology to extract and relocate ambient heat from the air. When you need to cool your home, it pulls heat directly from your indoor air and pumps it outside. This process is reversed for the purposes of home heating. When you need to cool your home, ASHPs outperform standard central air conditioners by extracting the existing heat from inside your home and pumping it outside. The cooling process is reversed when you use ASHPs to provide supplemental heat. By extracting the existing warmth from the outdoor air and pumping it into your home, you'll be able to run your furnace less. In fact, during the spring and fall, you may not need to run your furnace at all. GSHPs provide savings from the ground up. Thanks to energy provided by the sun, there’s enough stored heat underground to heat an entire household—even during the harshest Minnesota winters. These pumps use this “free energy” by directing the heat indoors where it’s compressed into a higher temperature before being distributed throughout the home. The process is reversed to provide home cooling. Indoor heat is transferred underground and dispersed into the cool earth. The advanced technology of GSHPs allows them to transfer heat to and from the earth, using only small amounts of electricity to operate the unit’s fan, pump and compressor. And they do it with highly durable, non-toxic polyethylene piping, which lasts for generations. All mechanical parts are housed indoors, away from weather, contamination and other potential sources of damage. The typical maintenance requirements are just periodic checks and filter changes. Not only do they heat and cool, GSHPs are also capable of providing the same incredible efficiency when paired with an optional hot water assist. And to accommodate a variety of differently sized and shaped yards, the unit’s underground piping can be installed either horizontally or vertically. If a lack of sufficient indoor space is an issue, a pump may be installed completely outdoors in some cases. These models are sealed within rugged housing to protect the components from the elements. GSHPs require no open flame, flammable fuel or potentially hazardous fuel storage tanks. And in the very unlikely event of a leak, the system’s non-toxic solution will not pose a threat to your family, property or the environment in any way. They emit zero greenhouse gases while using the earth as a clean, unlimited resource. Noise pollution is also a non-issue. GSHPs create no buzzing, humming or other noises often associated with conventional air conditioners. You may forget it’s even there. When you need to cool your home, GSHPs take the heat from your home and disperse it underground. Even during the harshest of Minnesota winters, the earth has enough stored heat to warm your home. GSHPs transfer that heat and move it indoors. They can also be used to heat water in conjunction with your water heater by using the heat that's transferred from your house. ETS Heating Systems put efficient heating at your command. They draw energy during off-peak hours while electricity is in lower demand, and, therefore, less expensive. That energy is then transferred into heat, which is stored within high-density bricks inside the unit. Hyper-efficient insulation prevents unintentional heat loss, limits static discharge and maintains low surface temperatures. An adjustable thermostat gives you full control over this 100% efficient heat around the clock. With no tank-filling or annual tune-ups, ETS Heating Systems are virtually maintenance-free. And an easy-to-read digital display contributes to simple operation. Room units recess seamlessly into cabinets or walls and their neutrally colored, high-grade urethane finish complements any décor. 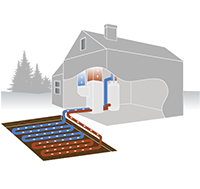 ETS Heating Systems use two types of highly heat-resistant insulation. One is a tightly woven layer of spun aluminum silicate. The other is made from materials identical to those used to cover space shuttles. Together, they create a standard for efficiency and safety. Built-in controls monitor and regulate internal and discharge temperatures and there are no emissions or combustible elements. Even so, be sure to follow recommended clearance parameters for your system. All units are covered by a five-year, limited warranty on parts. High-Density Ceramic Brick: Bricks made of special materials are designed for optimal heat storage. 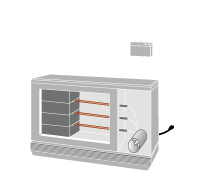 Heating Elements: Electric heating elements use off-peak energy to create the heat stored by the bricks. Super-Efficient Insulation: Space-age insulation around the core helps the bricks retain stored heat. Fan Assembly: Fans move air around the heated bricks, which is returned to the room. Thermostat Controller: An adjustable thermostat puts you in control of your desired comfort level. It may be built in to the unit itself, or on a wall in your home.